Bellevue Towers located at the intersection of NE 4th St and 106th in Downtown Bellevue. Bellevue Towers is a Eco-luxury 2 story tower of 539 units. The towers exterior is a very attractive mix glass and steel. The interiors feature Subzero refrigeration, Viking or Wolf range, stone slab counters, custom designed cabinets, wood floors, wool carpet. Amenities include a fitness center, spa, formal dining room w/ kitchen, 2 guest suite, 2-story community room, media room, s, 3 outdoor terraces and a half acre park. In addition, the building offers concierge service in both towers. 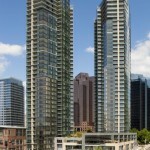 Bellevue Towers is located just one block from Bellevue Square and the Downtown Bellevue park. Bellevue Towers was designed for LEED Gold Certification.